Well-known family friendly consumer brands just keep getting more creative with the blog assignments I'm asked to work on. In fact, the Bufferin®​ Bucket List is probably among the most clever, introspective and fun projects I've been involved with during 5+ years of blogging. So for this post, I decided to think outside the box about my family bucket list to share my unconventional wish list as well as let you know all about the sweepstakes. As you can see from this image, I definitely took a different approach to creating my own "to do" bucket. Rather than including major indulgences I want to experience personally over my lifetime, I tried to think of smaller short-term bucket items -- none involving spending money. There's 3 items I want to work on myself and 3 things I'd like my kids to achieve that together will improve and enhance the overall quality of our family life. Each of these tasks on our list isn't going to be easy -- it's probably not too hard to figure out which of these I've chosen for me and which are for my four teenagers. For sure, I expect each line item to definitely be a challenge and involve hard work. I'm hopeful, though, by having this bucket visible to our whole family, we'll start tossing completed task clothespins into the bucket soon. Just in case you're curious, I do have a personal bucket list for my dreams, too. I've loved travel my whole life and have been very fortunate to have visited all 48 contiguous U.S. states. I have also been to dozens of foreign countries including exotic ones like Panama, Costa Rica, Iceland, Israel and more. So, to enter the #BufferinBucketList Facebook Sweepstakes I'm adding a new bucket item to my list: African Photo Safari. But, wait. I'm getting ahead of myself. Let me tell you about why everyone, especially moms, should enter this great contest. Bufferin is hosting a Facebook contest that just started and runs till March 14, 2014. 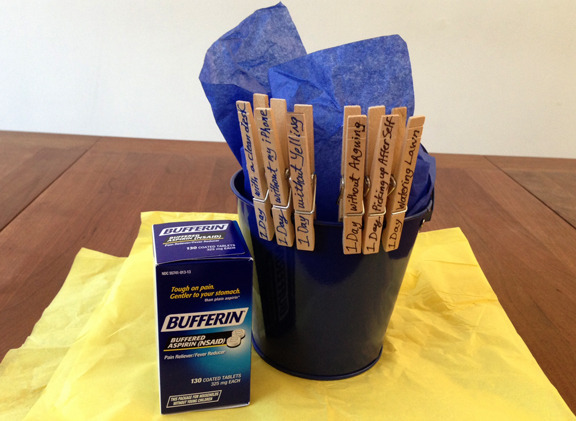 It's easy to get in on the fun by going to Bufferin's Facebook Page to enter the Bufferin Bucket List Facebook Giveaway for a chance to win one of three prize packages that each include a $1000 American Express gift card plus a full-sized bottle of newly reintroduced Bufferin Buffered Aspirin. The prize is intended to help the lucky ones who win a chance to push the aches and pains out of the way to put toward something on your own bucket list. just by sharing your own bucket list item. Winners will be chosen at random on February 28, March 7 and March 14. Bufferin Buffered Aspirin are the non-steroidal anti-inflamatory medication that's easiest on your stomach, without requiring a prescription from your doctor. Where is Bufferin Buffered Aspirin available? You can buy this product at Walgreens and Walmart stores. Now that I've told readers what's only my bucket list, it's your turn. Please leave a comment and share an item or two from your own personal bucket list. Comments submitted may be displayed on other websites owned by the sponsoring brand. Get the latest information on Bufferin at www.bufferin.com. This is a product-provided, sponsored conversation that contains affiliate links. I received a full-sized bottle of Bufferin® Buffered Aspirin and the craft supplies for my own personal use. All opinions, text and experiences are my own.